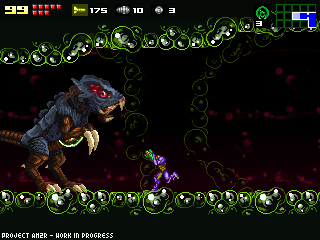 So, the Metroid: Confrontation is almost ready. I just have to tweak some details, separate the game from the main project, and test the game intensively. I was watching videos the other day, and found THIS cool speedrun of the first demo. This skillful player changed the Ridley song, and it fits the fight very well. So, I wondered if this game in particular should support some sort of modding. It wouldn´t hurt the story to have customizable aspects, since all you modify can be the way the Galactic Federation did the simulation. The question is, would you like me to include a way of making your own suit, backgrounds, tiles and soundtrack? This idea is just for Metroid: Confrontation, AM2R won´t support mods. I think that's a great idea, especially the suit changes. You've got my vote. As long as it doesn't postpone the expected release date, it sounds good. But PLEASE do not make the levels moddable. That would be like giving the people an open source version of the demo. Levels are not stored in external files, so it won´t be possible to modify them, don´t worry. I'll test. I'm on Metroid Fan mission. BTW you've got my vote. Meh. I'd rather the focus be on level design, gameplay, etc. rather than tiny tidbits like being able to customize your suit. yes, you definitely have my vote. Also, in the area with the first E-Tank, it you rapidly hit Enter, you sink into the ground and the message"Bass not loaded" displays. Well, you have to make sure that the limits of "mod-ability" are strict and impenetrable. Otherwise, you have a few slivers of your source code, for instance, leaked out to "hackers". But to the extent that the player/modder can change non-critical objects like their suit, eh. That's nice. Level modding, however, you'd need to limit. You don't want to make the game (even if it's a tech demo) TOO EASY, but you also don't want the modding to be TOO DIFFICULT. That way, the modder who wants an easier level can modify it the way he wants, but the "hard-mode" player doesn't stumble across the modifying components and ends up completely changing the game. Also, by being able to modify the levels and all that other stuff, you couldn't have a speed run "competition". Still, I would like the modding to include the soundtrack, if you ARE going through with it. Peace out. Word to your modders. I vote Yes for full modibillity. haha Octohunter i was playing the demo today and i started pressing enter really fast and then i fell through the floor and got the message "bass not loaded". "I will play it no matter whats done"
brilliant idea.yes,yes,yes you have my vote finally i can do things MY way changing the suit will be a bit tricky as i have wrote loads of ideas on a piece of paper and i just can't wait for the demo to be released. Hey, when AM2R is completed, is there any way you can turn it into a .nds or .gba file for us flashcart owners? If you did, it would be hailed as one of the best homebrew on the DS (along with the regular PC release). Please tell me if you can in an update or comment, it'd be awesome! I think it would be cool to have a bit of modability in there, lets the player have their own personal touch in the game, and as long as ridley is in the demo game thingo, ill be happy. 7 days till awesomeness is released across the net! The idea is not Bad !